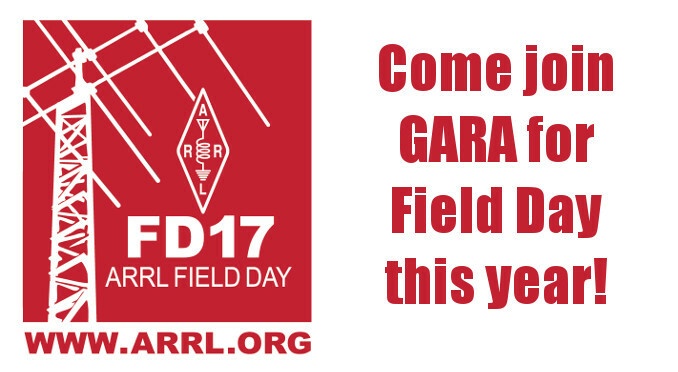 Join GARA for Field Day at Hagan Stone Park! The site at Hagan Stone Park is very nice with plenty of room for antennas. Operating positions will be inside the tree line, providing lots of shade. There are quite a few picnic tables, a fire pit, and a grill. Since it’s a camp ground, you can bring tents if you would like to stay overnight Friday or Saturday nights. We will be operating as class 2A this year. There will be an information booth, but no GOTA station unless we get enough volunteers to run it (none so far). If you want to volunteer, please let me know. Of course, the official Field Day event runs from 2:00pm on Saturday, June 23 through 1:59pm on Sunday, June 24, but setup will occur at 4:00pm on Friday, June 22. We will put up at least two wire antennas, with one hopefully supporting 160M. There are some tall trees at the operating site that would be good for a vertical wire antenna, and we can use the large field if someone wants to do more. So, if you happen to have a tall tower on a trailer with a nice Yagi, this would be a good time to bring it! We have full access to a large shelter which will be a nice area to setup operating positions this year. You’ll probably want to bring your own chairs since picnic table benches aren’t overly comfortable. We have most of the equipment for the two stations but would love to know if you have any equipment that you would be willing to let us use. If you have any questions or would like to offer gear or assistance, please contact Dave McLin, AC4A at dmclin@gmail.com. Find out more about Field Day here on the ARRL’s website. Thanks for your consideration! No Replies to "Join GARA for Field Day at Hagan Stone Park!"